The El Paso Chihuahuas teed off on 51s starter Stolmy Pimentel and reliever Josh Smoker for eight runs in the third inning en route to a 12-10 PCL victory at Cashman Field. The El Paso Chihuahuas didn’t take batting practice before Friday’s game. So instead they took it a few hours later in the third inning, teeing off on 51s starter Stolmy Pimentel and reliever Josh Smoker for eight runs in the inning. 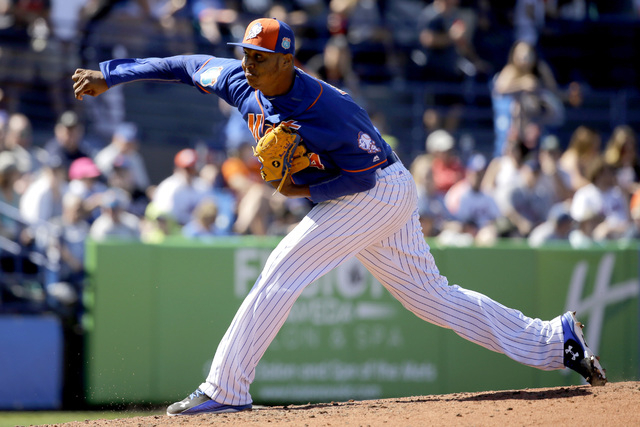 Pimentel, thrust into a start after the New York Mets called up Sean Gilmartin on Thursday, gave up six runs in 2 1/3 innings in a 12-10 Pacific Coast League loss at Cashman Field. But after the disastrous third inning, the 51s nearly pulled off a comeback, bringing the tying run to the plate in the ninth inning despite trailing by nine runs at one point. The two base-running mistakes didn’t seem nearly as important when they happened because the 51s were down by nine runs, but in the end, they loomed large. In the third, Brandon Nimmo pulled up at third with two outs and didn’t score on a T.J. Rivera single. And in the fourth, after doubling to lead off the inning, Matt Reynolds was gunned down at third easily. Had he not been thrown out, he would have scored on a double later in the inning. The attempt was aggressive, a sign the 51s didn’t feel out of the game even though the team was down big. Herrera helped lead the comeback, hitting a grand slam in the sixth inning for his second home run of the game to narrow the deficit to 11-6. He finished 4-for-6 with five RBIs and four runs. His two home runs gave him a team-high six. “I know that’s not my game, but I’m making good contact, so that’s going to happen when I make good contact,” Herrera said. After Herrera’s grand slam, the 51s gave themselves a chance with opportunities in the eighth and ninth. They rallied for three runs in the eighth on RBI singles from T.J. Rivera and Johnny Monell before leaving two on. And in the ninth, Herrera popped out with two runners on to end the game. “In reality, if we played a clean game, as bad as we pitched early, (closer Paul) Sewald’s coming in the game for a save up by one run,” Backman said. The 51s won’t get shortstop Gavin Cecchini back from the disabled list for at least a few more days. Cecchini, who has been dealing with a sore back, had what Backman deemed a “setback” on Thursday. Backman said Cecchini did full activities Thursday before taking himself out of the last round of batting practice. Cecchini didn’t do activities Friday, and before he gets back on the field, Backman wants to see him do them for two consecutive days. With a high school tournament taking place at Chickasaw Bricktown Ballpark before the 51s’ game Saturday at Oklahoma City, Cecchini won’t have the opportunity to do full activities, meaning the earliest Backman expects him back would be Tuesday. The 51s are playing with 24 players on the roster after Gilmartin’s call-up. They were expecting to activate Cecchini on Saturday to fill the spot.